In case you haven't heard, the world's second-largest Android maker will be second in line to announce its spring flagships, after Samsung is done and dusted with the Galaxy S9 and S9+ unveiling. Scheduled for March 27, the "mooore" event in Paris is expected to reveal the P20/Pro/Lite trio, all with notch-y screens, big batteries, and great cameras for their respective class. How great? 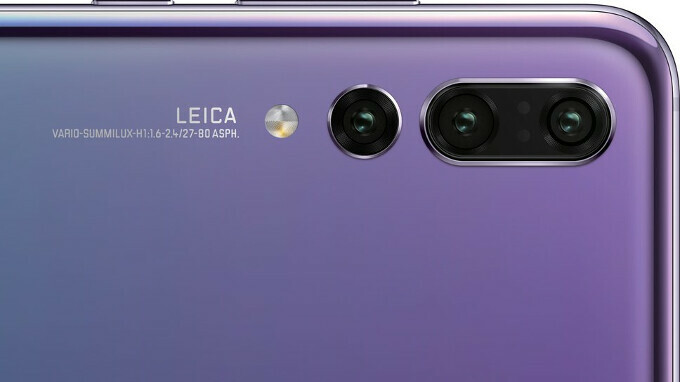 Well, how about triple-camera on the more expensive P20 and Pro models - a regular shooter, a monochromatic one (in a Huawei traditions), and a new telephoto lens - the best of all worlds. Well, save for wide-angle lens like on the LG flagships, but there is always the quad-camera possibility next year. We kid, but the "mooore" event teaser implies three cameras, and Huawei just outed two teaser videos which seem to confirm what does one of these lenses do. One of the promos is called "See Closer," in a reference to the possible telephoto lens - a first for a Huawei phone. That's not all there is to it, though, as the P20/Pro may be the first handsets with 3x telephoto zoom, as iPhones, Galaxies, Nokias and Xiaomi Mi6 offer 2x zoom. The reason for this speculation is the writing on the leaked press renders of the P20 you see above, which clearly state 27-80mm equivalent, or about three times zoom. This extra magnification should be more than enough for the casual shooter to bring its objects of shooting desire closer, like on sporting events, or simply shooting animals with the kids through the fence in a zoo. The other teaser video is called "See Bighter," and, while it might refer to some low-light king-fu on part of Huawei, given the Leica-branded lens with the listed wide f/1.6 and regular f/2.4 apertures, the footage actually says "a light studio in the palm of your hand… for a portrait that radiates," as Huawei puts it in the description, perhaps referring to depth-of-field tricks and portrait lighting. Let's not forget also that the new P20 trio apparently comes with a notch at the top, where the company may be housing all sorts of front camera shenanigans, but let's wait for March 27, before we draw too many conclusions. Lol, you gotta love those companies, I am sure it's only a matter of time before someone adds a 4th camera to a smartphone. What a time to be alive. Razors are up to 6 blades now. Whats up with phones with 4 lenses? Nice commercials. Didn't see reference to a selfie flash in the videos though. Hope 3x zoom is usable in this phone. iPhone 7P has worthless telephoto lens. Camera app doesn’t even bother to switch to telephoto lens on 2x zoom. Just keep on using digital zoom. Even when there is loads of light such as outdoors? How come they are not teasing the notch, I wonder? Huawei too ashamed to admit that it's a little monkey who does what it sees, eh? Notch on an Android Smartphone is a telltale sign of 'inferiority complex'. Oh well, G'Day! There's no doubt that it will be a great performer, it's just a shame that they had to release their beast in a package that looks like a $100 iPhone X clone. Exactly my thoughts. I am a big fan of Huawei and this seems to be a great phone especially the Pro version but they are letting me down in front of all those Apple fans who blame Android OEMs for copying (Not that Apple does not copy but there is no point in copying a flaw of another phone) They started removing the headphone jack, now this stupid notch. Same here. I wanted to wait till the p20's announcement before deciding on whether I should get the S9 or the P20, but after the recent leaks, I knew it was pointless for me to wait, as the phone's design is cheap for the price Huawei would be asking for.